BLACK FALCON have made it two overall wins in a row in the VLN at the seventh race of the 2018 season, having also taken victory at their last outing in the headline SP9 class at VLN5. 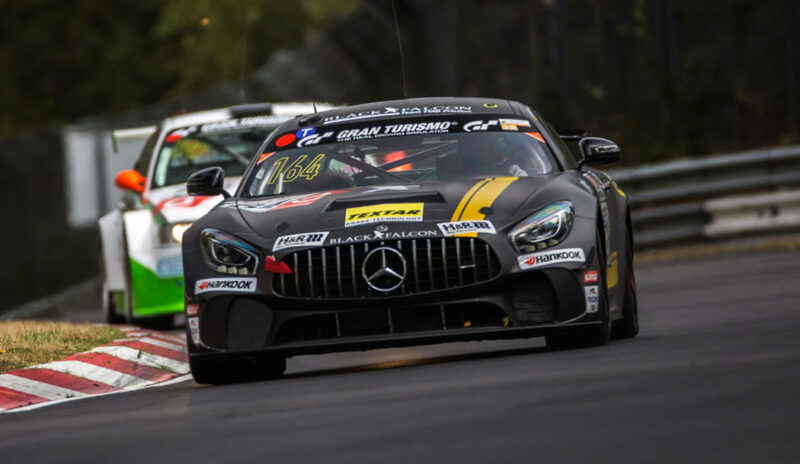 An inspired strategy and hard driving from the drivers of its Mercedes-AMG GT3 completed a successful day at the Nürburgring for the team in SP9, which was backed up by also taking class victory in the hard-fought SP10 class for GT4 machinery. Driven by the ace trio of Hubert Haupt (Germany), Maro Engel (Germany) and Manuel Metzger (Germany), the #6 BLACK FALCON Mercedes-AMG GT3 set a blistering pace in qualifying, missing out on pole by just a quarter of a second in what was an incredibly tight SP9 field. Come the midday rolling start to the race, Maro took his AMG down the inside of the second-placed car ahead on the long run to the first corner and was almost forced off the track by an aggressive chop, but he managed to maintain control despite losing a place. He immediately fought back through the opening Mercedes Arena section, and third place was regained during the opening lap of the Nordschleife. The team opted for a short first stint, bringing Maro into the pits after just half an hour to try and give #6 some clean air to show its true pace. Over the course of the next hour, relentless pressure was piled on their competitors, and BLACK FALCON’s strategy soon paid off. With 90 minutes gone, #6 gained the lead thanks to the AMG’s scorching speed: at one stage Maro was three seconds quicker than his pursuers. Following Manuel’s strong middle stint, with an hour to go the AMG was brought into the pits for its final stop – the first of the SP9 runners to do so thanks to the offset strategy. One by one the cars ahead peeled off for their own final stops, with the perfect result of Hubert regaining the lead as the final GT3s pitted. A Code 60 safety zone late in the race played into the team’s hands, Hubert clearing the area cleanly without losing time to the chasing pack while saving vital drops of fuel in the process. He maintained a healthy gap to the second placed car all the way to the flag to take an emotional victory for BLACK FALCON, winning by 15 seconds after a gruelling 28-lap race. A pair of Mercedes-AMG GT4s were entered in the SP10 class. The #163 Black Falcon Team IDENTICA AMG GT4 featured Stefan Karg (Germany), Fidel Leib (Germany) and Moritz Oberheim (Germany), who qualified in an excellent 32nd position overall, less than a tenth of a second off class pole. The trio put in an excellent performance in the race, taking the class lead before the halfway point. #163 crossed the line after four hours of racing with a 30-second gap to the second-placed car. Their sister AMG, BLACK FALCON Team TMD Friction #164, was driven by Axel König (Germany), Christoph Hoffmann (Germany) and Norbert Schneider (Germany). They qualified fifth in SP10, but made steady progress throughout the race to bring home #164 fourth at the flag, 45th overall. Two Porsches were entered under the BLACK FALCON Team TMD Friction banner. In SP7, Jürgen Bleul (Germany), ‘Takis’ (Switzerland) and Mike Stursberg (Germany) qualified the #57 Porsche 911 GT3 Cup MR II in a strong 18th overall, third in class and within touching distance of the GT3 pace. However, setbacks early in the race caused delays, and they had to settle for finishing 37th in the race, fourth in SP7. Following a great start, it wasn’t a great end to the day for the #395 Porsche 911 Carrera driven by Alexander Akimenkov (Russia), Ronny Lethmate (Germany) and Vasilii Selivanov (Russia). Despite an excellent performance in qualifying where they set the fastest time in the V6 class, problems forced them out of the race just three laps in. The next scheduled event for the team is next weekend, where BLACK FALCON will be racing in Spain in their final push to take the Silver Cup championship title in the Blancpain GT Series. You can support Team BLACK FALCON across all social media platforms: follow the team via twitter.com/TeamBlackFalcon, facebook.com/teamblackfalcon/ and instagram.com/teamblackfalcon to get live action updates directly from the tracks, as well as fantastic images of the team in action.